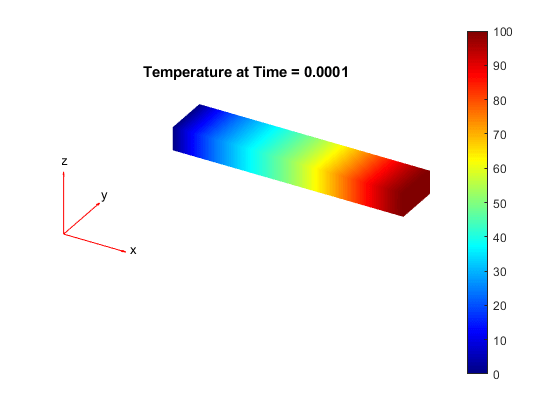 thermalresults = solve(thermalmodel) returns the solution to the steady-state thermal model represented in thermalmodel. 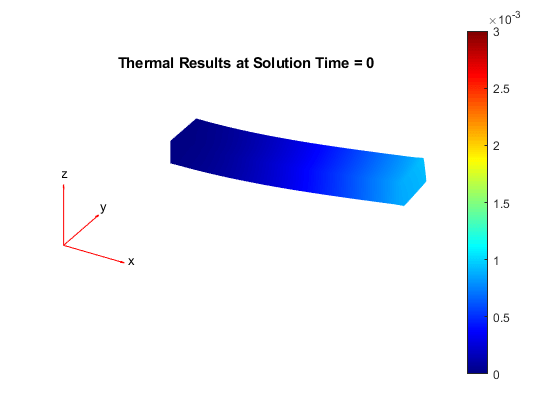 thermalresults = solve(thermalmodel,tlist) returns the solution to the transient thermal model represented in thermalmodel at the times tlist. structuralresults = solve(structuralmodel,'FrequencyRange',[omega1,omega2]) returns the solution to the modal analysis model for all modes in the frequency range [omega1,omega2]. Define omega1 as slightly smaller than the lowest expected frequency and omega2 as slightly larger than the highest expected frequency. 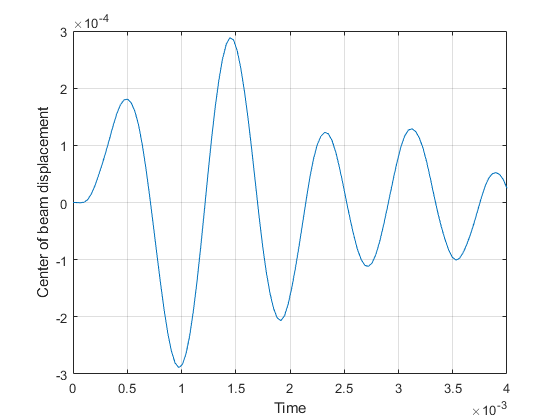 For example, is the lowest expected frequency is zero, then use a small negative value for omega1. structuralresults = solve(structuralmodel) returns the solution to the static structural analysis model represented in structuralmodel. structuralresults = solve(structuralmodel,tlist) returns the solution to the transient structural dynamics model represented in . structuralresults = solve(structuralmodel,tlist,'ModalResults',modalresults) solves a transient structural dynamics model by using the modal superposition method to speed up computations. 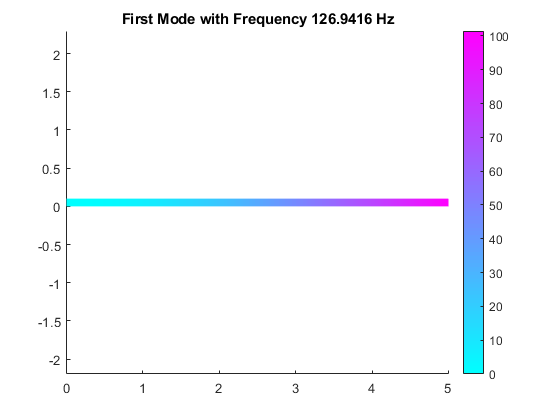 First, perform modal analysis to compute natural frequencies and mode shapes in a particular frequency range. Then, use this syntax to invoke the modal superposition method. The accuracy of the results depends on the number of modes in the modal analysis results. 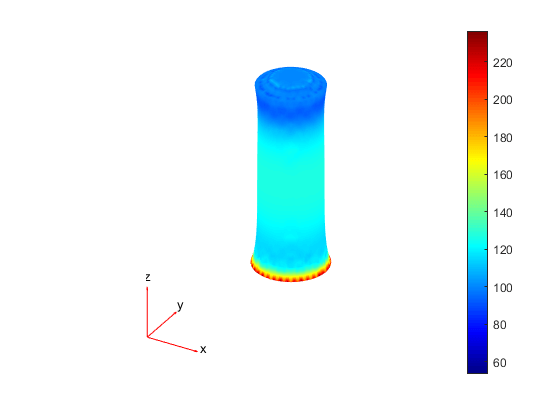 Solve a 3-D steady-state thermal problem. Create a thermal model for this problem. Import and plot the block geometry. Apply a constant temperature of 100∘C to the left side of the block (face 1) and a constant temperature of 300∘C to the right side of the block (face 3). All other faces are insulated by default. Mesh the geometry and solve the problem. The solver finds the temperatures and temperature gradients at the nodal locations. To access these values, use thermalresults.Temperature, thermalresults.XGradients, and so on. For example, plot temperatures at nodal locations. Solve a static structural model representing a bimetallic cable under tension. The solver finds the values of displacement, stress, strain, and von Mises stress at the nodal locations. To access these values, use structuralresults.Displacement, structuralresults.Stress, and so on. Displacement, stress, and strain at the nodal locations are structure arrays with fields representing their components. 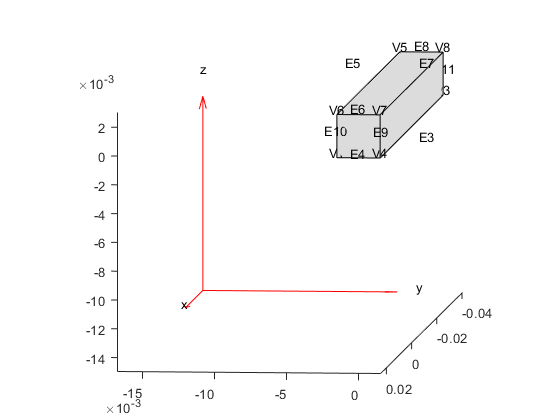 Plot the deformed shape with the z-component of normal stress. 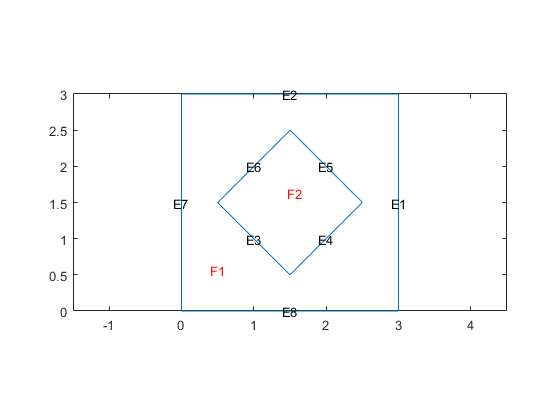 Solve for transient response of a thin 3-D plate under a harmonic load at the center. Zoom in to see the face labels on the small plate in the center. Specify that all faces on the periphery of the thin 3-D plate are fixed boundaries. Apply a sinusoidal pressure load on the small face at the center of the plate. Generate a mesh with linear elements. The solver finds the values of displacement, velocity, and acceleration at the nodal locations. To access these values, use structuralresults.Displacement, structuralresults.Velocity, and so on. Displacement, velocity, and acceleration are structure arrays with fields representing their components. 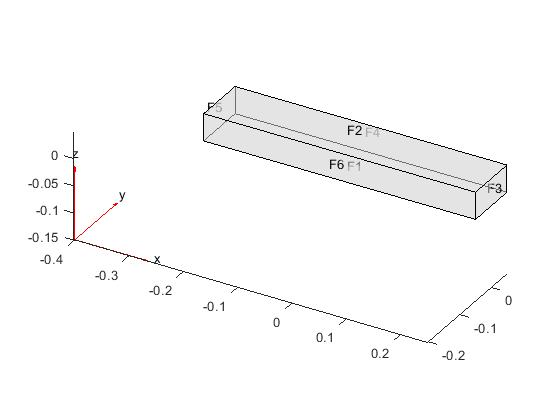 Find the deflection of a 3-D cantilever beam under a nonuniform thermal load. Specify the thermal load on the structural model using the solution from a transient thermal analysis on the same geometry and mesh. Create and plot the geometry. Specify the thermal properties of the material. Specify the constant temperatures applied to the left and right ends on the beam. Specify the heat source over the entire geometry. Plot the temperature distribution for each time step. Create a static structural model. Include the same geometry as for the thermal model. Use the same mesh that you used to obtain the thermal solution. Specify the Young's modulus, Poisson's ratio, and coefficient of thermal expansion. Apply a fixed boundary condition on face 5. 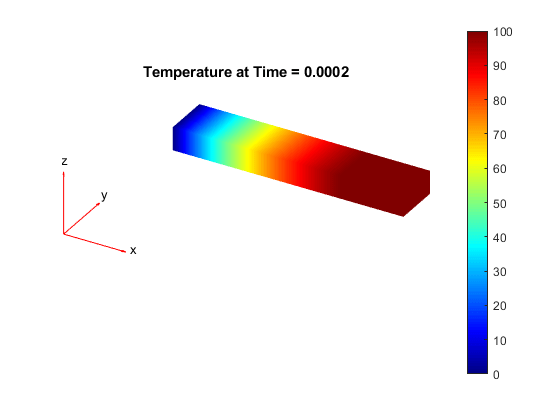 Apply a body load using the transient thermal model solution. By default, structuralBodyLoad uses the solution for the last time step. 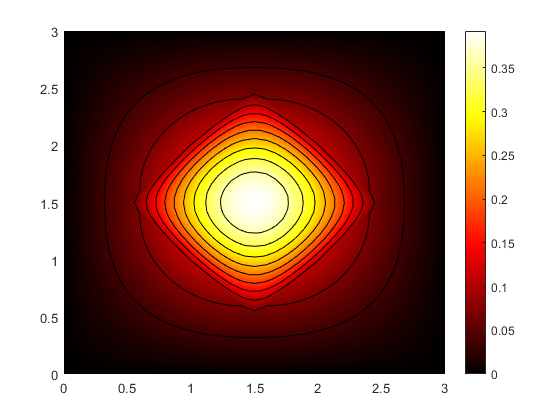 Plot the deformed shape of the beam corresponding to the last step of the transient thermal model solution. Now specify the body loads as the thermal model solutions for all time steps. 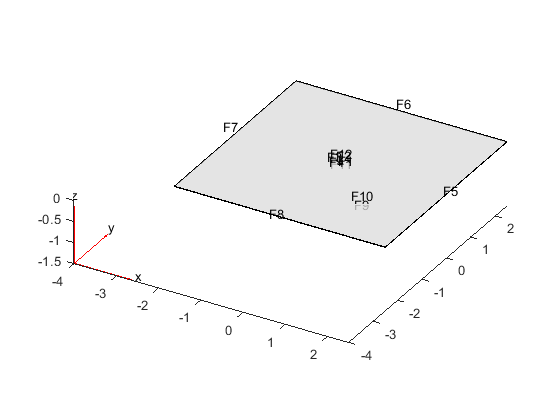 For each body load, solve the structural model and plot the corresponding deformed shape of the beam. 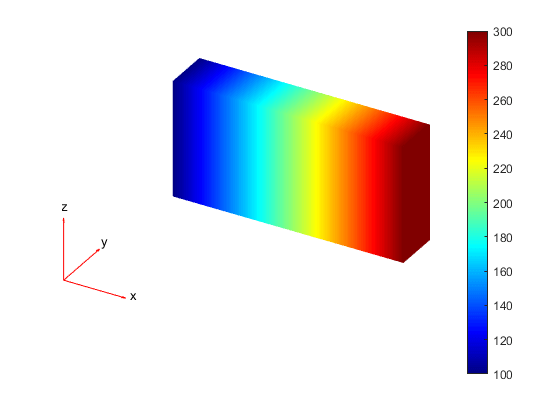 Solve the for transient response at the center of a 3-D beam under a harmonic load on one of its corners. 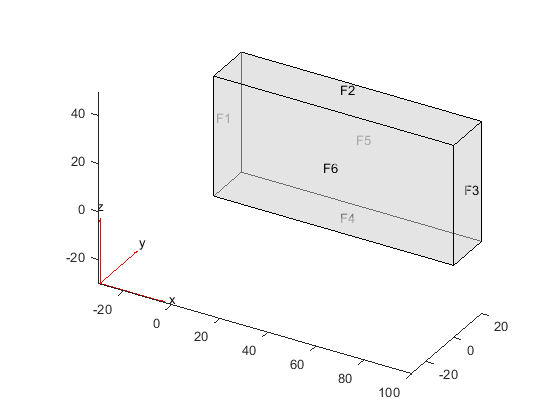 Create a modal analysis model for a 3-D problem. Create the geometry and include it in the model. Plot the geometry and display the edge and vertex labels. 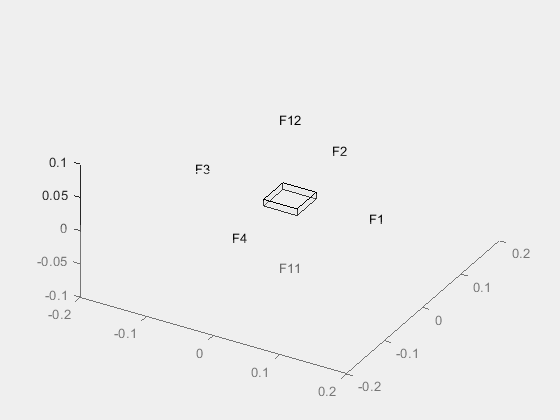 Specify minimal constraints on one end of the beam to prevent rigid body modes. For example, specify that edge 4 and vertex 7 are fixed boundaries. Solve the problem for the frequency range from 0 to 500000. The recommended approach is to use a value that is slightly smaller than the expected lowest frequency. Thus, use -0.1 instead of 0. 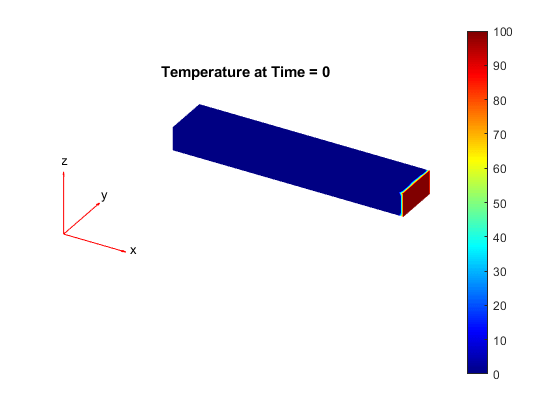 Create a transient analysis model for a 3-D problem. Use the same geometry and mesh as for the modal analysis. Specify the same values for the Young's modulus, Poisson's ratio, and mass density of the material. 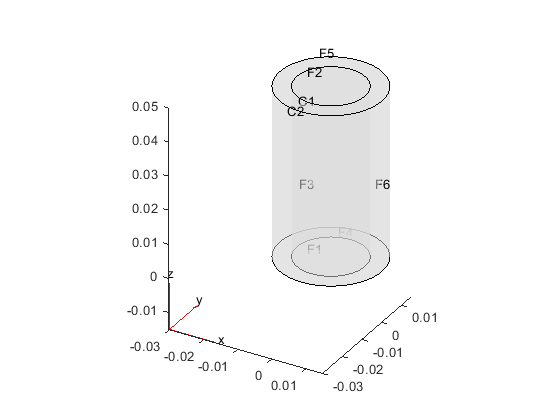 Specify the same minimal constraints on one end of the beam to prevent rigid body modes. Apply a sinusoidal force on the corner opposite to the constrained edge and vertex. Specify the relative and absolute tolerances for the solver. Solve the model using the modal results. Interpolate and plot the displacement at the center of the beam. Structural model, specified as a StructuralModel object. The model contains the geometry, mesh, structural properties of the material, body loads, boundary loads, and boundary conditions. Solution times, specified as a real vector of monotonically increasing or decreasing values. Frequency range, specified as a vector of two elements. Define omega1 as slightly smaller than the lowest expected frequency and omega2 as slightly larger than the highest expected frequency. For example, is the lowest expected frequency is zero, then use a small negative value for omega1. Modal analysis results, specified as a ModalStructuralResults object. Thermal results, returned as a SteadyStateThermalResults object or TransientThermalResults object. The type of thermalresults depends on whether thermalmodel represents a steady-state problem (thermalmodel.AnalysisType = 'steadystate') or a transient problem (thermalmodel.AnalysisType = 'transient'). Structural results, returned as a StaticStructuralResults, TransientStructuralResults, or ModalStructuralResults object. The type of structuralresults depends on whether structuralmodel represents a static problem, a transient problem, or a modal analysis problem. To check the type of a structural analysis problem, type structuralmodel.AnalysisType. When you use modal analysis results to solve a transient structural dynamics model, the modalresults argument must be created in Partial Differential Equation Toolbox™ version R2019a or newer.